“It might not be a household name although a record of 39 consecutive increases of more than 5% in Halma’s annual dividend suggests that it should be, especially as this track record means the FTSE 100 firm is a good example of how a company that gets the basics right can reward patient investors,” says Russ Mould, AJ Bell Investment Director. The company continues to think on a long-term basis, with careful investment in new products and services, as outlined by a 12% increase in research and development spending as well as the Halma 4.0 growth initiative, which is designed to help the company thrive in a digital world. There are strong regulatory drivers associated with Halma’s hazard detection and life protection products and the company’s ongoing investment means it continues to maintain and develop the competitive position of its core business. Both of these facets are reflected in a near-21% operating margin. Management continues to use select, small acquisitions to supplement existing momentum within the business, not create or transform it with one knock-out, potentially high-risk deal. “The result is as well-run, well-financed company that has risen through to the ranks since its 1972 stock market listing to reach the FTSE 100 at a time when it has generated £1 billion in annual revenues for the very first time. “In addition, the combination of a strong competitive position, long-term thinking and high margins translates into a phenomenal track record of growth in the annual dividend payment to shareholders. “Even if the dividend yield itself is just 1.0% (based on the historic payment of 14.68p per share and a share price of £14.13) investors should not be deceived. 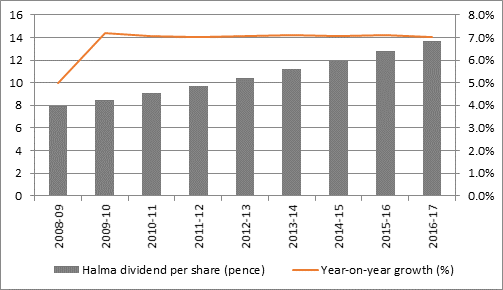 Halma’s dividend has doubled in the past decade alone and the manner in which this reflects the company’s strong long-term position and transmits management’s confidence in the future brings share price rewards. “While Halma’s shares have occasionally been buffeted by wider market forces, such as the bear market of 2007-09, they have provided strong total returns over time, combining capital growth and dividends, helping investors protect their wealth from the ravages of inflation.